Welcome to the Our Daily Bread Designs October Release Blog Hop! If you arrived here from Fran's Blog, you are in the right place, if not, you might want to start at the ODBD Blog, and hop from there. There will be THREE winners who will each win 1 Free Stamps set of their choice and ONE GRAND PRIZE Winner who will get their choice of 3 FREE SETS- for full details click here. The Hop will run 8am EDT Oct. 1st til 8pm EDT Oct. 2nd. The Christmas Tree Collage is stamped in Coffee Archival on a piece of Cosmo Cricket pattern paper, I added a bit of Spica Pen to the ornaments and candles and sponged all edges of pattern paper with Walnut Stain Distress Ink. The Christmas Rose is stamped on a scrap of pattern paper in Coffee Archival, and cut with Spellbinders Holiday Tags Die. I stamped the flower again on Cherry Cobbler and paper pieced it over the pattern paper image, adding a bit of Spica Pen to the berries and leaves, and a brad center. The sentiment is from the Christmas Door Set. Beautiful design! Love your layout and the image is adorable! Love how you stamped the elements over the papers. Ahhhhhhhh how adorable, luv your layout GF, just precious. Lisa this is incredible!!! 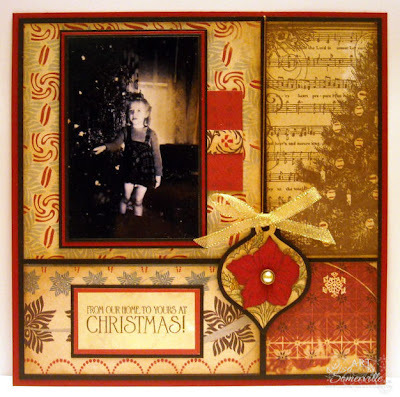 I love the collage tree stamped in the vintage ink color!!! A gorgeous page indeed! What a stunning layout Lisa!! I just love the black and white photo with the pop of vintage colors! Beautiful use of this months stamps for your Gorgeous layout! totally awesome, Lisa!! genius idea on the ornament! Ohhh Lisa love your page layout!!! Love the vintage picture and the tree collage stamped in coffee! Beautiful effect and love the ornament! I so wish I had more photos to play with! This will surely inspire many to use stamps on their layouts!!! Have a great weekend! LOVE how you used them on a scrapbook page! Fabulous! How sweet the picture is and then the stamped image in the next panel!! I love that the stamped image doesn't take you away from the picture, just highlights it!! Beautiful!!! Lisa this is wonderful, LOVE your layout! This is a great LO. Gorgeous LO! the vintage look with the tree is beautiful. This page is soooooooo you! Beautiful design, style & class! This is a beautiful page, the vintage look really fits the old photo. wonderful Lisa - love this look. What a fabulous layout! It actually brought a lunp to my throat- very nostalgic! This is lovely!! Wonderful job on the layout! Beautiful page! Love the idea of using a vintage family photo - awesome! What a fabulous page. Great way to use the Christmas Tree Collage image with your mom's pic. The layout is perfect and the sentiment and Holiday Tag with that fab distressing all around make this just downright beautiful. What a fabulous page, Lisa! Love the vintage look and wonderful design! Beautiful! <3 This layout is so warm and makes me think of Christmas with a warm fire blazing. This is so pretty. I am interested in making cards like these myself. I found you on Our Daily Bread Blog. I am now following you. I have found some other blogs with these creative ideas and have asked if they would be willing to advise me what is involved. I haven't heard back from anyone yet. I also have a blog http://talesfrommyjournal.blogspot.com so you could check me out. My blog is about my hair jewelry. I hope you will get back to me and stop by my little window on the internet. How wonderful, love the vintage photo! What a fabulous vintage look, its absolutely lovely! Lovely! Warm colours and warm sentiment! I just love this page. The details with the Spica pen are a nice touch. I don't have one of those yet. You've inspired me to get one though. Thanks for sharing such a gorgeous creation! What a beautiful vintage page! I love the layout and how you used elements from the different sets to create this masterpiece! shows all over your card. is simply icing on the card! Great use of the stamps for a scrapbook page! Beautiful page, Lisa! Love the vintage colors. They go so well w/ the pic you used. Wonderful collage feel to this. Nice twist to use an old photo of your mom. What a beautiful layout. I really love the traditional feel. wow, that's what i love about doing a blog - i get to see so many different ideas to using the stamps. and i love the sepia tones you have used here for that vintage look. thank you. beautiful scrapbook page!!! love the vintage feel to it!! a fantastic and very personal creation! thanx a lot for this inspiration! Terrific page. I love to use old vintage photos for my art work. Great use of the stamps also!! this is a great scrapbook page. Such yummy, rich colors and that Christmas tree collage works perfectly into the blocking for a page! More great ideas - thanks for sharing! I love this card. The distressed ink and the mixed background paper are great and the ornament really dresses it up. Fun use of a photo for Christmas cards too! What a beautiful Christmas memory page! What a wonderful scrapbook page you have prepared. What a dear picture of your Mom (who is such a cutie in the picture)! I love how you've used the new sets to display the wonderful picture. Thanks for sharing. This is a wonderful page, just beautiful!! Can you say amazing? I can and I see it right here. Beautiful collage look to the 8x8, very vintage, too! Gorgeous! Though I'm not a scrapbooker, this is a beautiful page and will make a beautiful addition to any scrapbook! Fantastic Vintage page! Wonderful layout and the colors are just perfect. awesome page. thanks for showing a use for stamps on a scarpbook page. Beautiful page! I love it! Your card is beautiful. I love the differences in style of all the design team. So many ideas! This is beautiful, Lisa! I love your pages, and your model! The tree stamp is wonderful in this layout. What a lovely heritage look. Love the vintage feel of this gorgeous color-blocked photo card...what a fabulous design and idea! Great page Lisa, I am thinking of doing some 8x8 but it is so small! Your page has inspired me! Lisa - Love the way you did this - so pretty. Thanks for sharing. what a great way to show the sets and have a wonderful memory captured. great job. I love your layout. Very nice. I love the way the card is divided. That is so neat! Wonderful layout. The colors are so vintage looking, and the design of the layout is great. Thank you for sharing it. What a great scrap page; love the layout and vintage colors. Thanks for sharing. This is a gorgeous layout. Love the vintage feel and use of design here. Yay, a scrapbook page! Thanks for showing us the verstality of these stamps! Wow! wow.... this is a beautiful layout. And the Tree Collage image is so beautiful on a scrapping page. Love your idea! What a beautiful, vintage scrapbook page. Love the way you've incorporated the new stamps. Hey Lisa, Wow your layout is awesome!! The color combanation is outstanding!! Beautiful job!! what an awesome scrapbook page! It has been such a long time since I have done that lol. I love the vintage look of this layout! Wonderful page. Love the archival look - great colors. This is amazing Lisa! I am so glad you did a scrapbook page - it really shows how well these stamps work for scrapbooks too! This vintage page is fabulous - makes me want to dig through old photos and get to work! Great page. Love the vintage feel. Very cool lay out. Love it. As I'm loving all the new Oct Stamps. Great layout. Love the muted tones and the way you stamped onto patterned paper. What a really gorgeous layout thanks for sharing with us. Beautiful..very christmas-y..very vintage. Great job! Very cool, love the vintage look to this! So pretty Lisa, you've created an absolutely adorable scrapbook page! Love it!! What a great LO. It's such a great way to show how the stamps can be used for more than just cards! Beautiful!! What a cute little girl love your lay out. and the colors u use. Happy World Card Making Day Lisa! This LO is gorgeous! Who's the cutie in the photo? Love the beautiful festive paper and pretty ornament! Just a darling, vintage inspired creation. Your LO is so sweet and special! I love the stamped papers and the pretty colours you used. Lovely design! Beautiful page...lovely use of the new release stamps. Wow absolutely stunning!!!!! The picture and the design are fabulous!!!!! Way to go Lisa!!!! What an absolutely amazing page! I just love the way you highlighted the photo and made it stand out even more the the fabulous stamping! Beautiful! just amazing, what a wonderful keepsake you've made! Love the vintage look to you layout. Oh wow! I would love to learn how to do this. Just amazing! Thank you! Lovely card Lisa, Love the vintage look to it. Lisa, I love seeing stamps used on scrapbook pages -- I started as a scrapbooker and seeing multiple uses for things always makes me want to buy them because, of course, they are so economical! :) Your page is beautiful! What a great SB page. Love that picture too. Beautiful. Loving this vintage layout. What a wonderful memory to capture you mom as a child at Christmastime. The use of Christmas Tree Collage and Christmas Rose with this picture really pulls the page together. Fabulous. Blessings! This is such a lovely vintage page. Simple elegance done beautifully. Great usage on the tree collage stamp. Great card and coloring. I love this one a lot. Lisa, your page is fabulous!!! Love how you used the collage stamp on the scrapbook page! Lovely way to say Merry Christmas! What a great collage, love it. A lovely layout and a beautiful way to show case the photo of your mum.Magic. What a very pretty layout! The layout of this card reminds me of a scrapbook page. Beautiful! Love your page! Everything flows together beautifully! Beautiful page. I love the look. What a beautiful way to display the picture of your mom! Love the vintage colors and the layout! Beautiful Layout and great colors! I absolutely love the "antique-ness" of this. The stained look is so wonderful. Stunning!!! Wonderful use of these gorgeous stamps!!! This is stunning and so very creative! It is beautiful in the style and colors you chose. I love the tree over the music! That photo of your Mom must be a treasure...it is in a great place of beautiful art. Wow!